Because this best-selling French body-care line checks all boxes: the body wash is loaded with the goodness of rich plant oils & antioxidants that soothe and nourish the skin, soft subtle scent is intoxicating to the senses, the big family size bottle carries substantial product to last months and the price is just unbeatable! Well, finding me in Paris, luxuriating at a barmy French bath filled with donkey milk and rose petals; guzzling glasses of red wine while massaging away worries and igniting my senses…! But girls, trust me on this – lathering up with Le Petit Marseillais body wash cherry blossom is the next best thing! Spending time at a spa is one of the most relaxing things you can do for your body and mind. But not all of us are fortunate enough for the extravagant indulgence. So if you’re on a budget like me and trying to indulge, the best way to do this is by finding yourself a good body care product that’s not only good for your skin but gives a kick to your senses as well. 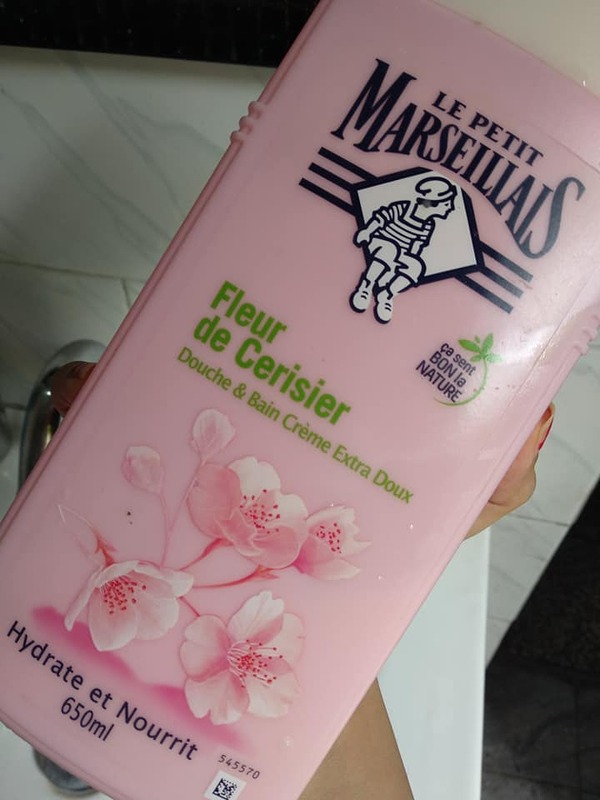 I’ve been on Le Petit Marseillais kick ever since I’ve started using this brand’s products – shampoo, body wash, shower cream, conditioner, mousse – all swoon-worthy stuff! Le Petit Marseillias is a drugstore brand that’s sold in most grocery shops in France. French like quality stuff, so no artificial fragrance or harsh ingredients here. Fragrances for Le Petit Marseillais are created by consummate perfumers at Givaudan, world’s largest manufacturer of flavors and scents, which has worked with Calvin Klein, Prada, Diptyque, Tom Ford, Narciso Rodriguez and many more prestige designers. The subtle floral scent of cherry blossoms makes me happy every time I use this body wash in my shower. The gentle, pH-neutral formula forms satisfying suds without striping or drying the skin. Even though, it says it’s a shower ‘cream’, the consistency is not so thick and it rinses off thoroughly and easily, making my skin squeaky clean. Even better, skin is left feeling super soft and silky as if you’ve just come out from a spa! All skin types, especially those with dry and sensitive skin. Apply a dollop size amount on the loofah and rub it all the body. For me, all seasons including summer. For oily skin types, winter. 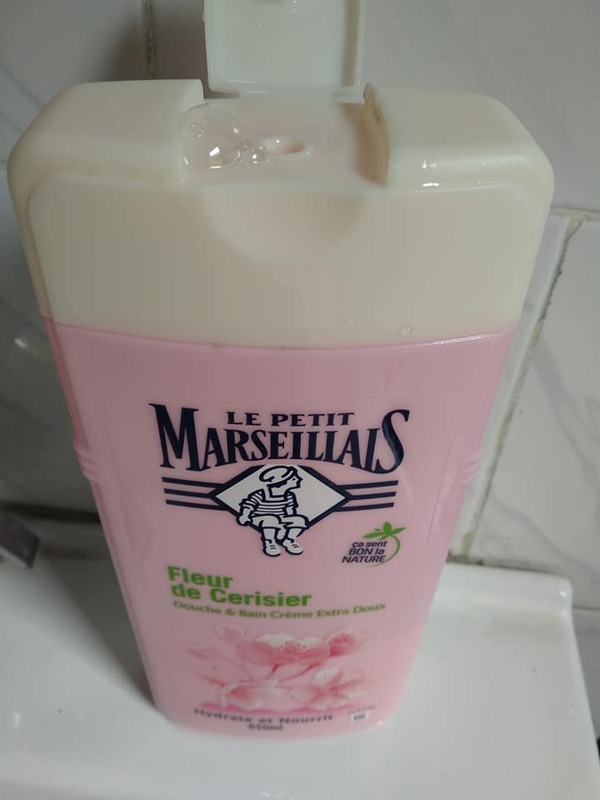 A huge 650 ml bottle of Le Petit Marseillias body wash cherry blossom costs around €10.40, which should easily last a few months if used daily. Substantial quantity; reasonable price; lovely, light texture; intoxicating scent; suds well and leaves skin looking super clean and buttery soft. It doesn’t leave any residue, while rinsing off thoroughly and easily, which is what we expect from a good body wash or shower cream. Yes, yes, yes – as and when I can get my hands on this but in a different variant or flavor. 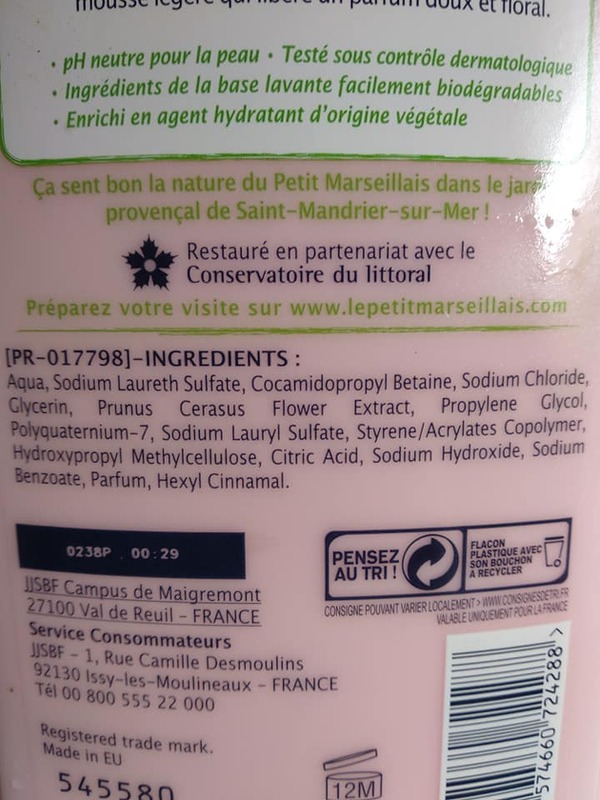 There are in all 22 variants of Le Petit Marseillias body washes available in France. The collection consists of unique fragrances and flavors inspired by the Southern France. The most popular ones include: Vanilla milk, Orange Blossom, Cherry Blossom, White Peach & Nectarine, Ma vie en Rose, Lavender Honey, and Cotton Milk & Poppy. I’ve got Cherry Blossom and Ma vie en Rose from Hubby’s last visit. Next time, I’d like to try their Vanilla Milk and Orange Blossom, which are global favorites. Do you know about Le Petit Marseillais body wash line? 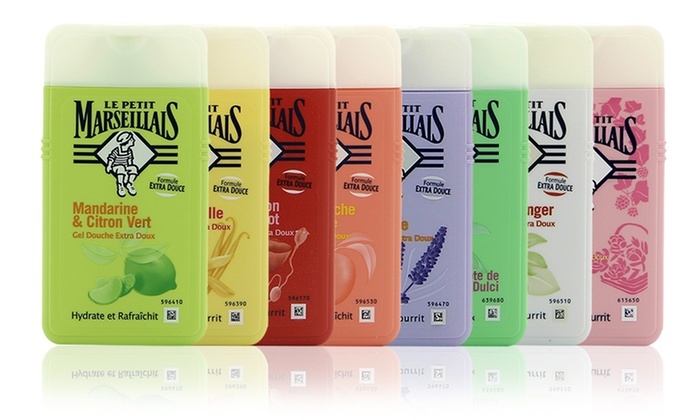 Have you tried Le Petit Maseillais body washes before? If yes, which one is your favorite and how’s your experience of the brand and the product? Please share your thoughts in comments below. Would love hear about your take on this.